There has been some debate about the pose of the mounted skeleton of Phar Lap on display at Te Papa. 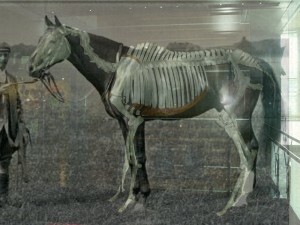 Using digital photographs, an image of the skeleton has been superimposed over photos of Phar Lap and used to “prove” that the skeleton has been mounted incorrectly. Unfortunately, the image of the skeleton that has been used was taken with a wide-angle lens. As wide-angle lenses tend to exaggerate the size of objects closest to the lens this results in considerable distortion (known as parallax error), and the ribcage is out of proportion to the rest of the skeleton. To compare the skeleton it is essential to use an image from a camera with a lens the same as that used for the original photograph. When the two images from cameras with lenses of similar focal length are combined it is apparent that the skeleton is not so badly mounted after all! Even in this combined image the lenses used were not exactly the same, so the two images cannot be aligned. The skeleton was mounted in the 1930s after public donations raised sufficient funds to employ two taxidermists. The value of Phar lap’s skeleton is as a historical object rather than an anatomical specimen. Should the skeleton be dismantled and reconstructed in a pose that we today consider to be “correct”? There may be some imperfections in the way the skeleton was mounted – but this is part of the story of Phar Lap. We wouldn’t erase the cigarette out of a Rita Angus painting simply because today smoking isn’t fashionable. Museums preserve and look after objects for future generations – and that does not include altering them fit our twenty-first century perceptions. The argument that “Museums preserve and look after objects for future generations – and that does not include altering them to fit our twenty-first century perceptions.” doesn’t really apply in this case as it was simply a mistake in alignment of the skelton which SHOULD be corrected. Otherwise you would always keep showing misaligned artworks in frames simply because the orginal curator in 19xx framed it (badly) that way. That would be fairly silly – as it would be not to show the skeleton in its correct stance today. Hi everybody, nice try to explain why is the Phar Lap skeleton standing not so wide open, but I am afraid, that nobody din´t noticed that the picture you displayed is not a picture of the famous racehorse Phar Lap, but the horse on that picture is CARBINE, which was Phar Lap´s ancestor. So guys, be so good and next time try a better argumentation. Phar Lap’s skeleton is an anatomical specimen. In life, it was part of a superb animal machine. It should be mounted in such a way as to represent this. It should not be displayed as a Salvador Dali-esque artifact that misrepresents the functionality of one of New Zealand’s most successful athletes. To an anatomist, a poorly mounted skeleton is bad science, not art. Anton van Heldon’s exhibition of whale skeletons is good science and a proud display for all the world to see. We can do better for Phar Lap. I’m afraid no amount of window dressing will establish that Te Papa’s skeleton is anything other than woefully short in the back. If you look closely at the skeleton that you have overlaid in your example, you will quickly observe that it is blown up way too large in comparison to the photograph of the horse. For a start, the wither in your skeleton (that’s the area at the base of the neck) is a good 6-7 centimetres above the picture. If you go to Phar Lap’s lower front leg and take a line through the fetlock joint, you will see that you are several centimetres too low. If you shrunk the skeleton image and lined these two points up correctly with the photograph (it appears you are happy there are no parallax errors in this image? ), then you will find that the skeleton is well short. Take a look at the hind legs. The hock in the skeleton looks to be 10cm lower than the picture, and this follows on through the foot. The tail bone is too low. The space occupied between the vertebrae by disks in a living horse is roughly a third of the width of each vertebra. Given that Phar Lap’s vertebrae are essentially touching together, it would seem manifestly impossible that Phar Lap could be anything other than short in the back. Alex Davies, a retired professor who taught veterinary anatomy at Massey University for many years, is quoted in a follow-up story on Horsetalk on this issue. (http://www.horsetalk.co.nz/news/2009/08/145.shtml) He has seen Phar Lap’s skeleton on display and believes the lack of space between the vertebrae would account for the back being 10cm short. That aside, the poor horse is standing sickle-hocked and looks far removed from the champion he was. This, to me, comes down to the purpose of the exhibit. Is the purpose to provide viewers with an example of 1930s skeleton mounting? As Professor Davies is on the record as saying, the world’s museums are full of badly mounted skeletons. I would venture to suggest that people want to see Phar Lap, not some relic from the 1930s. Reconfiguring Phar Lap’s bones is not about fitting in with 21st century perceptions. The bones will be the very same bones you have now. They will just be displayed in a manner that might portray the champion in a more fitting light.